Well howdy, and hiya, and OH HAI. I'm Marcy Harriell (marce for short), Actress, Singer & Dancer. I'm also known as my alter ego, Oonaballoona from Kalkatroona (oona for short), Sewist, Player, and all around Merry Maker. But I'll happily answer with wild abandon to any name you call me, especially if you're calling me to cocktails. I started up this corner of the web over a decade ago, as a way to keep our family and friends close during a temporary move to Los Angeles. (As a matter of fact, I named this site after my most favorite childhood nickname, given to me by my parents.) Before making the trek, a dear friend gave me a great piece of advice: if you're going to stay sane in lalaland, get a hobby, and get one fast. Though I rarely do as I'm told, I had been itching to learn how to stitch. I've always seen clothing as a beautiful armor, and ever since I was old enough to have control over my own closet, I modified and painted and wrangled a new colorful shield daily. Learning how to make that armor from scratch was long overdue! In between diving into film & TV work, I started my first pattern: New Look 6557. I had picked out some horribly synthetic, astonishingly flammable stuff, filled with giant dazzling technicolored phoenixes (phoeni?). I didn't bother reading much about how to morph that questionable fabric into a dress, as patience was not so much a virtue I was familiar with back then. I just placed the pattern pieces where ever they'd fit, and got cutting on the largest available surface: the bed. On top of a fluffy comforter. Those of you who know better can imagine how that worked out. When Broadway called us back to the stage side of the business, my newfound obsession survived the journey home to New York. I hammered on, learned the rules, learned which rules to forget, learned there is always more to learn. When I'm not acting, singing and dancing, I'm still learning every day, sewing in four square feet of space, right next to my very best friend. You can find us here most nights after five-ish, having a Rob crafted libation, most likely laughing. And now you can see us doing just that in our new series on NBCU's Bluprint: Re:Fashion. We aim, as always, to get you smiling and inspired. Glad to have found your postings .My name is Lou and live in the UK.I am hoping to learn a new skill of sewing.I have beautiful material big space to work in, a pattern. Finding it hard just to get going.Not sure what Im doing...dont want to spoil the fabric and I have no one to ask.Be grateful of some tips for a beginner. Hi Lou! I'd start with a muslin (toile) - get some cheap fabric of a similar type as your fashion fabric and use that to make mistakes/learn fixes. Then the fashion fabric version will be so much easier and better fit. Good luck! the first pattern i ever cut, i went straight for my fashion fabric, and it did *not* turn out. i'm not as big a fan of muslin, i find that it never really mimics the fabric you're actually going to use. if you can't find cheapo fashion fabric to practice on, old vintage bedsheets have a lovely soft drape! and above all don't beat yourself up in the process. 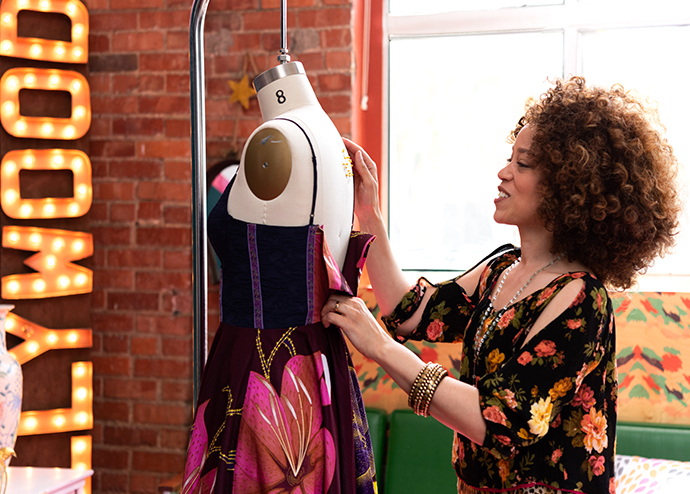 have fun at the stage you're in, each garment takes you to the next level! glad we could help, tori! Hello sew sister I am so glad I found your blog on the Burda style site during the fan favorite top 50 sewing blog contest to which I was also nominated. You seem to have such a great spirit that comes through on your bog not to mention your beauty! You are simply amazing and I love your work!! right back atcha-- i'm loving your creations so much! Just found your blog!! Merry Christmas to me!! thank you! Love your sense of style!! and FUN! a belated merry merry to you-- happy valentine's day?! xo! You have a new fan from Chicago. I'm so happy to have found your blog. thankya alice, glad to see you here! I read the article on you in Vogue Patterns, very inspired. Thank you Marie! I was so flattered by that lovely article. hi i'd like to invite you to stop by east coast trimming on 38th street in the nyc garment district. we have a large collection of beautiful hand beaded trim, european and domestic braids and shelves of vintage trim and bridal. we are the proud new home of Hyman Hendler Ribbon. come on by and get trimspired. Hi Oona. you have a great blog. wanted to invite you to come down to East Coast Trimming, 142 west 38th street in nyc garment district. we have a wide collection of hand beaded trim both contemporary and vinatge along with a large selection of european and domestic braided trims and fringes. we have a beautiful bridal collection as well and are proud to be the new home of Hyman Hendler Ribbon. come on in and get as we have coined "trimspired"
Thanks a bunch for you kind words on twitter regarding my little Curve Runner. I would love to send you one of my prototypes for adoption as my Thank You! If you want, send me your address to claire dot cochran at hotmail dot com and I will get one to you pronto. Longtime lurker, first time poster. I just had to know, were you and Michelle Wolf separated at birth? 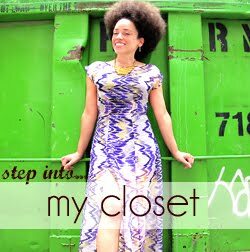 Your Bluprint refashion segment was so fun - please do more of those! I love your blog! And I love all the African fabrics you use! You would have a lot of fun shopping here. Johannesburg is full of wax cloth and other fabrics from all over Africa! Ive enjoyed your projects for about 3 years now and love the format, especially for photo storage in the My Closet page. I need to borrow your format for my own sewing photo storage for my line of clothing, Lavoie Boho Ladieswear. Using the free business page on Facebook for my project pic storage is not as ideal as what youve got here. I moved from NYC to NC and envy the resources of the garment district... but it forces me to come up with my own solutions. 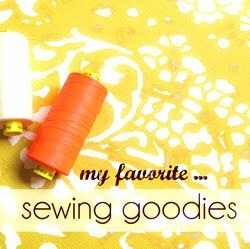 Sewing is is BEST hobby in the world! Thank you for all you are doing to encourage all us sewists.